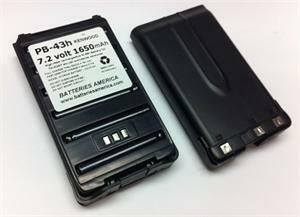 PB-43h : 7.2volt 1650mAh rechargeable NiMH LONG LIFE battery for the Kenwood TH-K2AT radio (all worldwide versions). Replaces original PB-43N, PB-43H. Clips onto back of radio. Re-charges with stock charger systems.